Dubai: It’s 5am on a foggy morning and the Dubai Airport Operations Control Centre (AOCC) is on full alert. The visibility along the DXB runways has dropped to below 600 metres and the cloud base under 300 feet. Fifteen of the 70 AOCC staff are on duty, coordinating the activities of hundreds of staff across the airport, and assessing, among other things, the real-time feed of flight movements, airfield traffic and passenger flow across terminals, down to the exact numbers standing in the immigration or security queues. The situation is fluid, the forecast gloomy. 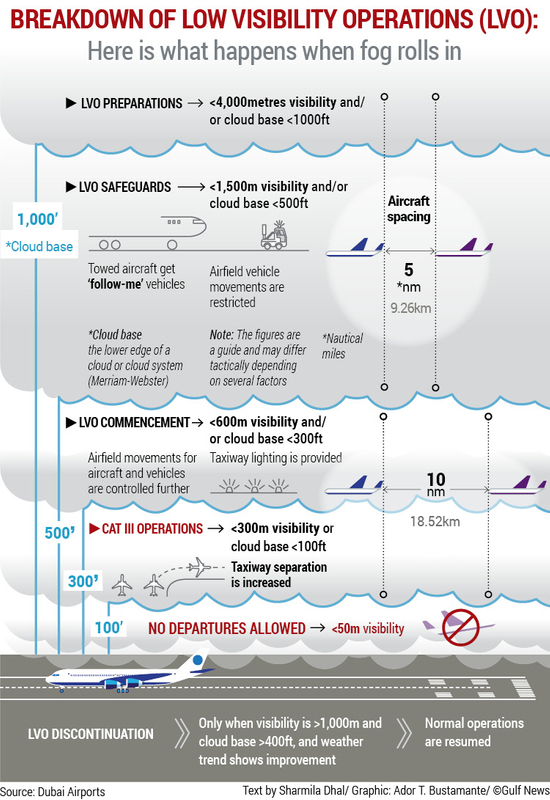 As Low Visibility Operations (LVO) commence, movements of aircraft and vehicles on the airfield are restricted, lighting is provided to the taxiway and the distance between arriving and departing airborne aircraft is doubled from five to 10 nautical miles (nm). 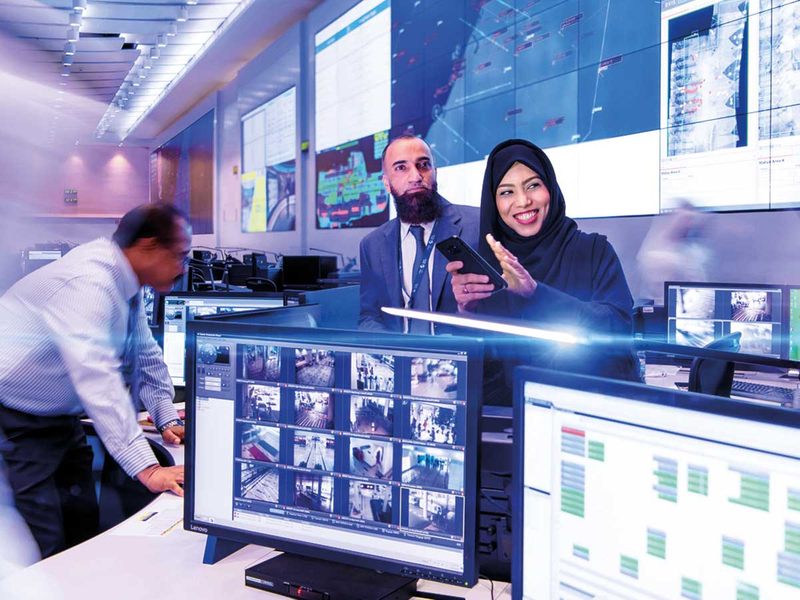 AOCC staff are in constant communication with the airlines, including home carriers Emirates and Flydubai – to adjust schedules and coordinate the movements of flights and passengers. Should the visibility drop further, as it drastically did to below 100 metres on Christmas Eve last year, the LVO protocol is escalated and full disruption response activities swing into action. 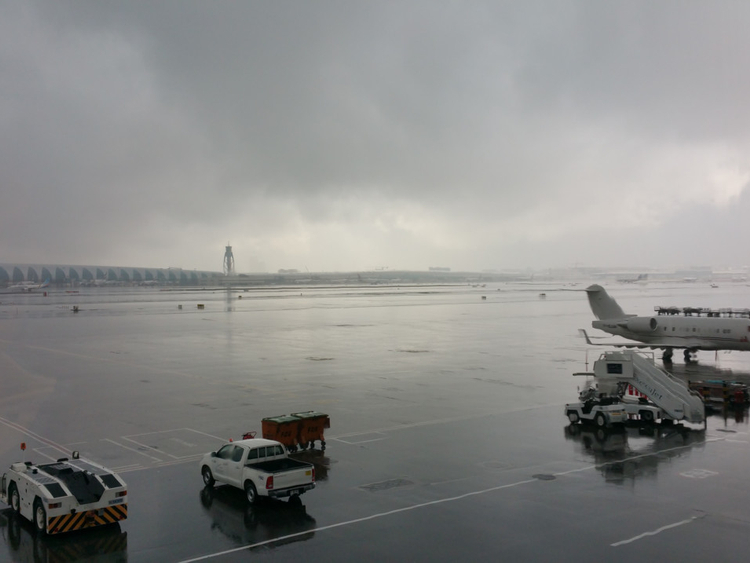 One of the foggiest days in recent history, December 23, 2017 saw significant disruption to flights and passenger journeys, with 105 flights being delayed across T1,T2 and T3. Some outbound passengers were delayed for over 10 hours as departures were grounded and many inbound passengers had their flights diverted to Dubai World Central, Fujairah and Al Ain. “Fog in Dubai can be thick, persistent and disruptive,” said Damian Ellacott, vice-president, AOCC, giving Gulf News an exclusive lowdown on the actual sequence of events that take place every time fog (or other disruptive weather) rolls in. This could well be every other day in the coming months. According to the National Centre Meteorology (NCM), the heavy fog season in Dubai which typically extends from mid-October to March, has already seen 108 fog days this year, compared to 156 last year. A complex atmospheric phenomenon, fog often reduces visibility to less than 1,000 metres, even below 100 metres sometimes. The airport usually receives the fog forecast from the Met services a day earlier. Preparations for the fog begin when the visibility falls below 4,000 metres and is forecast to deteriorate further to below 1,500 metres, and/or the cloud base is below 1,000 feet. The flow-rates or number of arrivals and departures, ranges from 66 aircraft per hour at peak periods and in good weather, to as low as 20 aircraft per hour during LVO. Ellacott is also quick to add that the allocation of arrival and departure slots when the flow-rate is reduced is always managed dynamically. “Reduction from high to low flow-rate may not be linear and it is impossible to say over how long a period of time it will reduce as it depends on the day for many reasons — the intensity and persistence of fog [or other bad weather], time of day, day of week, holiday or non-holiday, airport restrictions, outside factors and many other considerations. He said: “DWC is the preferred diversion airfield for aircraft inbound to DXB in the event of a dense fog. If aircraft are holding at DXB and cannot land, they are diverted to DWC if it has capacity." Passengers should understand that we take the protection of their journeys through Dubai Airports very seriously and place every effort to minimise the impact during what can be difficult circumstances. Ellacott said aircraft can be told not to get airborne from their outstations if the weather forecast is very bad and diversion capacity is likely to be unavailable in the UAE. “Priorities are always safety and passenger comfort, and to recover from any schedule disruption ASAP,” he said.